Sky adds 4OD to Catch-Up TV, four C4 channels to Sky Go, and Film 4HD and More 4HD | What Hi-Fi? Sky has confirmed that a comprehensive package of content from Channel 4 will be joining the recently-announced upgrades to its service. Not only will users be able to access Channel 4's catch-up service, 4OD, they'll also get four channels added to the Sky Go mobile service, and both Film4 and More 4 will be available in HD. 4OD will launch on the Sky platform early next year, allowing users catch-up access to all the UK's terrestrial broadcasters, while the Sky Go offering will expand to encompass Channel 4, E4, More 4 and Film 4. Subscribers will be able to access programming on all the Sky Go platforms, including home PCs, Xbox 360, iOS devices and selected Android smartphones. In addition. high-definition versions of More 4 and Film 4 will be available to users of the Sky+ HD set-top box. Sky+ has announced a series of changes to the Sky TV Guide, which are set to roll out in the coming months, including the addition of catch-up TV services, ITV Player and Demand 5. First-up is a new Undelete feature. Undelete will see all the shows that you delete from the Sky Planner will go in to a Deleted tab. You will then be able to see the programmes you've deleted and restore any that have been deleted by mistake, ideal for fat-fingered users. 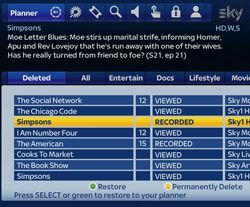 The oldest items will still be deleted automatically from within this folder, keeping your Sky+HD hard disk free, or you can delete manually if you're absolutely convinced you no longer want a programme clogging up your box. Sky Anytime and Anytime+ downloadable content – complete series, boxsets and more – are now moved in to an On Demand section of the website, and there's the addition of a Catch Up TV portal. The Sky Catch Up TV tab will include content from the last 7 days on Sky channels plus the long-awaited inclusion of other catch-up TV services. ITV Player and Demand 5 will be there from launch, while BBC iPlayer is promised "shortly after launch", giving you all those catch-up TV services direct from your Sky+HD box. You'll need to have your Sky+HD box connected to your router to use the Catch Up TV services and to access all the On Demand content on offer. Another new section is the Store tab, where you will find all the pay-per-view movies to rent on the Sky Store platform. Other tweaks see the Docs tab for documentaries repositioned for more prominence towards the middle of the screen and updates to the Help menu for more specific guides on how to use certain Sky features. Also, if you use the Sky+ iPad app, you can now choose to disable the iPad's remote control features in the Sky Guide's Parental section. The new Sky Guide will be an update done automatically to your Sky box, though when you receive it depends on the type of box you have. The first boxes to get the update will be the latest Sky+HD box (DRX890 model) and the Sky+HD 1TB box. If you want to know how to find out what model Sky box you have then head over to the Sky Help Centre. We've been told by Sky that the roll-out will take place over the next few months rather than weeks – patience is a virtue. Let us know as and when you get the update and the new Sky TV Guide in the comments section below.